Thank you, thank you, thank you to everyone who donated or helped in any way to raise the amount needed to help us Raise the Roof. This was a huge but vital undertaking for our Church. 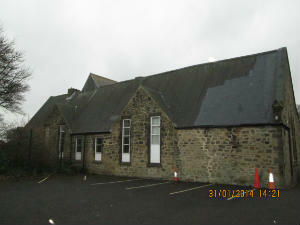 Shaun Howe Roofing of Shiney Row was contracted to replace the whole of the roof to the rear of the Church buildings as seen from the main car park. The work commenced Monday, 1st December and was completed on time by Friday, 19th December. The new roof looks really good and is receiving lots of complements so we are very grateful to Shaun and his men for their excellent work and the manner in which the work was carried out. 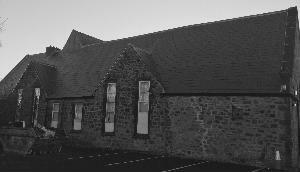 The rear of the buildings attached to the Church showing the Main Hall (old school room) windows. The Church and main hall etc date back to 1880. Sometime, (possibly in the 60's) the whole roof covering the Church and attached buildings (main hall, kitchen. social area etc the tiles were covered with roofing felt which has been deteriorating over the years. In 2004, all the roof to the west (ie as seen from the main road) was replaced leaving the east side (back - as seen from the rear car park and covering the main hall, kitchen and office) to be dealt with at a later date. Costly emergency repairs were carried out after there were leakages over the kitchen section last winter and as there had been also been more recents leaks, it was essential that the work to replace the roof was carried out as soon as possible. As it became apparent that the work was really urgent, we received a very welcome and generous private, cheque and the offer of a loan for the balance to make up the £15640 needed. We then received a very welcome grant of £500 from Allchurches Trust and fortunately by the time the payment for the new roof was due, it was found a private loan was not needed. The brilliant total of amounts from fundraising events, generous amounts for buy-a-tile and private donations plus grants, the much reduced balance was able to be met from Church funds . So we can now continue to provide safe and welcoming accommodation for Church related activities and also for all the community of whatever beliefs (or no beliefs) to carry on enjoying now and in the future. School Coffee Morning: This was on Friday, 28 November. The children from the school sang (beautifully as always!) and the event was very well attended. The proceeds were very kindly divided between the school PTA and our own roof fund and we were delighted to receive £123. Inspire Ladies Choir: Thanks must go to this choir, conductor Richard and Chris on piano plus everyone who contributed goodies for the raffle and cakes etc for the get-together after the concert on Saturday, 15th November. It was a really enjoyable evening and a further £225 was raised for "Raise the Roof"
Christmas Fayre: One of the stalls on Saturday, 8 November sold items solely to raise funds for "Raise the Roof" and made £158.10. Lynn also had a stall to sell her new Cookery books compiled from your recipes. See Lynn if you haven't got your copy yet - well worth having and only £5 each. Buy-a-tile: A huge "thank you" to everyone who donated so generously. Harvest 2014 - We had a great traditional harvest weekend. The Church looked beautiful, the Sunday Service led by Dr Angela Lishman was inspirational and well attended and our Harvest Supper with entertainment by the Joy Singers was enjoyed by all. The proceeds plus donations were £400 with £200 going to Methodist Relief - "All We Can" and the remainding £200 to our Roof Fund. 5 July: Raise the Roof Family Fun Day from 11 am to 4 pm - this was a great success - even the sun shone! We raised the fabulous amount of £1243.20 on the day and £28 since making a grand total £1271.20. A big "well done" to everyone! Flyers were delivered to every house in the Village and posters given out for display both in the Village and in many Churches in the area. The publicity paid off and lots of people (including families) came for the bargains. 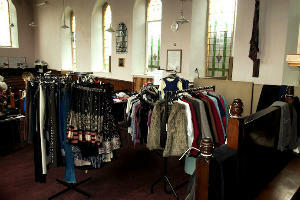 The Church itself was transformed into a charity shop - and displayed as much Nearly New stuff! 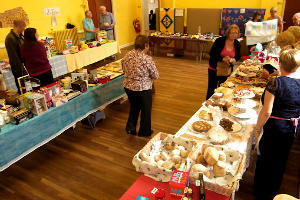 The main hall was packed with stalls covered with books, toys, jewellery, home produce and bric - a - brac. Lunches and teas were served in the Social area and several fun games were outside in the sun and enjoyed by the kids. Thanks must go to everyone who contributed the overwhelming amount of items - we even had home-made bread and buns brought down from Northumberland. Thank you also to all the helpers many of whom were not connected with the Church also to the Village Hall for the loan of games, clothes rack and bunting. More photos on the Photo Galley Page. Although there were lots of clothes sold on the day, people had been so generous that there were lots left. What to do with them! Some have been packed away and maybe a rail will brought out at a coffee morning or other event. The remainder was bagged and after several phone calls to different "Clothes for Cash" companies, Joseph, proud to tell that he is a Christian, answered and came out the same day. After weighing and calculating 70p per kilo - the best rate in the area, we received £74.20. The toys have also been sold for a further £15. The books have been packed away for sale at a later date. The bric-a-brac considered to be saleable at the Christmas Fayre has been been kept with the remainder passed to a Charity Shop. Some items kept from the Fun Day are being listed for sale on Ebay! Watch this space for results - keep your fingers crossed!